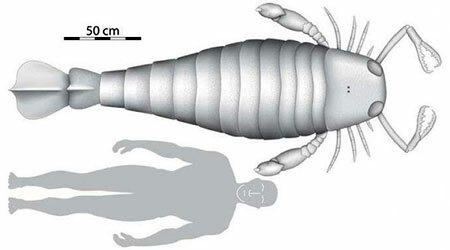 Recently, the first one was captured; it's a kind of huge crustacean, like the sea scorpions that once lived on Earth. Science fiction fans are delighted by the recent discovery of an enormous fossilized claw, part of an ancient sea scorpion. If the rest of its body was proportional, it was the largest bug that ever lived. Simon Braddy, a University of Bristol paleontologist, was one of three authors of a paper announcing the discovery. He said that the fossil was from a Jaekelopterus Rhenaniae, a kind of scorpion that lived only in Germany for about 10 million years, about 400 million years ago. The entire organism was about eight feet long; according to scientists, sea scorpions did not grow claws that were substantially larger on one side or the other, unlike other crustaceans. He stated that the sea scorpions were not only in competition with fish that were heavily armored, the scorpions were also cannibalistic. "The competition between this scorpion and its prey was probably like a nuclear standoff, an effort to have the biggest weapon," he said. "Hundreds of millions of years ago, these sea scorpions had the upper hand over vertebrates -- backboned animals like ourselves." Read more at Nature and LiveScience. Thanks to Eric Nodacker for the tip and the sf reference.